The Mineral Resource at Woodlark Island contains over 800,000 ounces of Inferred Resources at a 0.5 g/t cut off and 545,000 ounces of Inferred Resource at a 1.0 g/t cut off. These known Resources offer a significant opportunity to increase the Ore Reserve though a targeted program of infill drilling to increase the confidence of the Resources. It is not practical to drilling all Inferred Resources to a higher Resource category and a more targeted approach can be applied by considering the potential economics of the Inferred Resources under the Feasibility Study parameters. 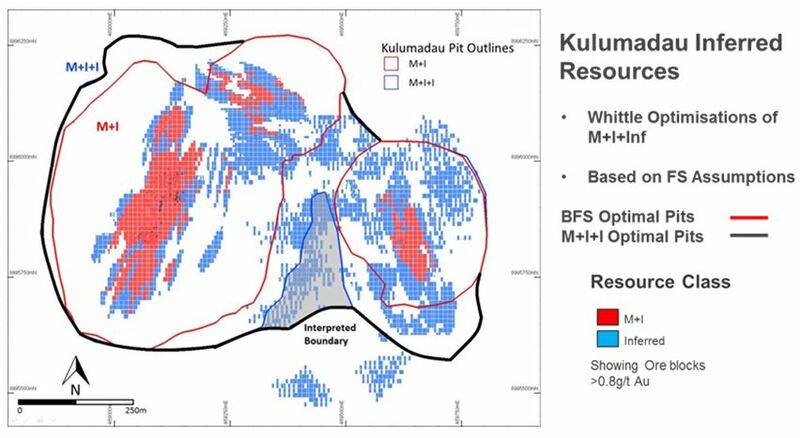 The figure shows the estimation of the potentially economic Inferred Resources at the Kulumadau deposit, based on the Feasibility Study economic parameters and the change in the optimal pit outlines when the Inferred Resources are included in the economic assessment. 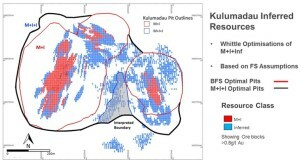 This process has been applied to the Inferred Resources at the Kulumadau, Busai and the Woodlark King deposits. The table below shows the potential of all of the Inferred Resources at the Project. Project wide Resource conversion, has the potential to increase mining inventory by 200,000 to 250,000 ounces at cost of US$ 900 to US$ 950 per ounce. This work provides a focus for a targeted infill drilling program, which would improve the efficiency of the known Resources. Assuming the successful conversion of the Inferred Resource, at a US$1,400 per ounces gold price, these Resources have the potential to extend the Project life and create in excess of $US100 million additional cash flow with minimal additional capital costs.